Many of the ingredients in a deluxe pizza go into this no-hassle salad. Feel free to substitute pepperoni for the Canadian bacon. The dressing is great on other salads, too. In a small bowl, whisk the vinaigrette ingredients. Chill until serving. 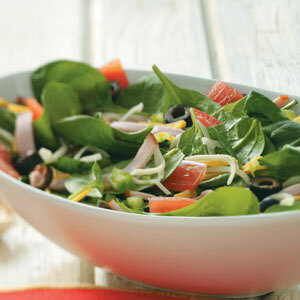 In a large salad bowl, combine the spinach, bacon, cheeses, tomatoes, pepper, olives, basil and chives. Just before serving, whisk dressing and drizzle 1 cup over salad; toss to coat. Save remaining dressing for another use. Yield: 10-1/2 cups salad plus 3/4 cup leftover dressing.